A man is tempted by an insidious, curvaceous force that feigns the feminine form and he slowly finds himself wound up like a ball of yarn for the cats’ night out. That’s how Vertigo begins, but only in the most superficial sense how it dissolves. It stars James Stewart as Scottie Ferguson, a private eye hired by a friend to spy on the friend’s wife Madeline (Kim Novak), whom the man believes is possessed by a familial specter who has long overstayed her tenancy in the human body. Soon enough, Scottie finds himself in love, and perhaps so too does Madeline. Things truck along in ghostly romantic chiller fashion from this point on, but director Alfred Hitchcock couldn’t resist slopping some blood on the tracks. This entry was posted in Film Favorites, Review and tagged alfred hitchcock, Confrontational Classics, Film Favorites, jimmy stewart, Metatextual Madness, Score: 10/10, those films on December 24, 2014 by jakewalters98. Perhaps no film director has been studied, debated over, written about, psychoanalyzed, copied, butchered, chastised, and celebrated as Alfred Hitchcock. Inevitably, the question always comes up: What’s your favorite Hitchcock? A tough question, and admittedly not one I would retort to with Rear Window But if the question was “what is Hitch’s greatest commentary on film?”. Well, that’s another story altogether. This entry was posted in Film Favorites, Review and tagged alfred hitchcock, Film Favorites, jimmy stewart, Metatextual Madness, Score: 10/10 on July 22, 2014 by jakewalters98. Psycho is often reductively referred to as the grandfather of all modern slasher movies. In some sense, that is perhaps true. It’s one of Hitchcock’s most clearly defined “horror films” (along with perhaps Frenzy), and it is ultimately about a killer. On these notes, it is undeniably effective, with Hitchcock’s sense of mood and atmosphere slowly burning their way into the viewer’s psyche and his editing and film construction famously giving more than a few people a lifetime fear of a certain means of personal cleansing. But Psycho is much more than a superior slasher picture. Its center lies in audience expectation and implication, an exercise in subversion first and foremost. The first half of the film makes it quite clear that Marion Crane (Janet Leigh, a big star at the time as well as a typical Hitchcock blond and thus naturally the film’s star going in) is to be the main character, a woman looking to embezzle money in order to run away with her lover, Sam Loomis. For nearly the first half of the film, we watch her meticulously fulfill her plan before arriving at the roadside Bates Motel, where she meets Anthony Perkins’ Norman Bates. He’s friendly but slightly unnerving, a little creepy, and socially awkward, and he seems tied down to his mother in ways we don’t yet understand. We expect that the film will end up being about the relationship between the two. Furthermore, we assume Perkins will slowly come to obsess over Marion. Not only do we assume this, but Hitchcock no doubt intended it. 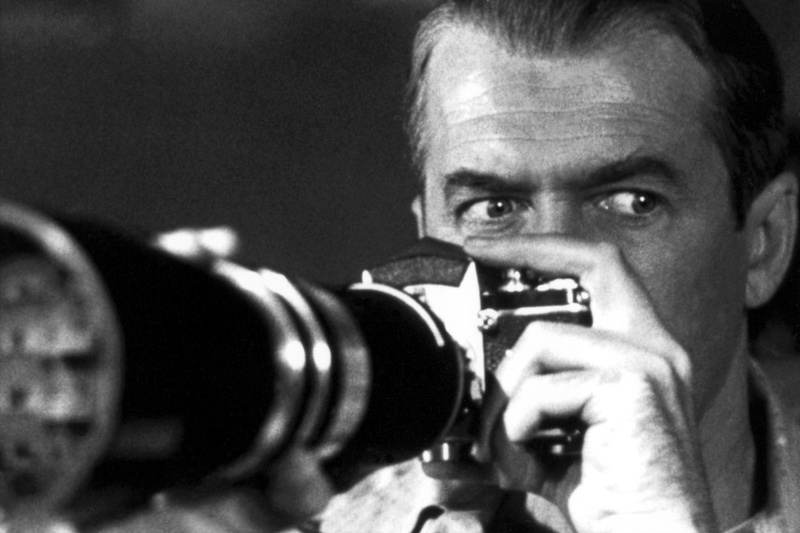 Many of his films, including almost all of his masterpieces, are about obsession in one form of another, and he clearly sets this film up knowing audiences at the time would expect the same. The difference here would be a female main character, perhaps finally reflecting Hitch’s willingness to commit to a garish, oppressive, and furious full-on criticism of the male gaze by moving beyond Vertigo’s uneasily likable but nonetheless ruggedly classical Scottie Ferguson and toward a more passive male figure, someone who was ultimately less powerful than either of the film’s two female characters. Backing this up are the repeated visual images of Norman’s mother in shadow, ever glancing and high-perched like a vulture from up in the Bates’ house behind the motel. She never physically appears, and exists only as a shadow, and yet she still has full power over Norman. All in all, Hitch’s set-up relies heavily and fundamentally on the viewer’s knowledge of Hitch as a filmmaker. Then, suddenly and with the confidence of a master, Hitch pulls the greatest trick ever played on an audience in a film. We all know by now that the obsession story ends with the shocking murder of Marion by who we assume to be Norman’s mother, still bathed in shadow. The scene, famously taking place while Marion is in the shower, is a masterwork of framing and editing. Its list of techniques runs a mile wide, but the more notable include jarring quick-cutting, an ear-piercingly slashing and now famous score by Bernard Herrmann that sounds like humanity’s nightmares on a chalkboard, the film’s stunning black-and-white monochrome, essential to enhance the nightmarish detachment of the film, and a diabolical zoom outward from Marion’s eye post-mortem. The scene has been written about to death, rightfully so for its astounding construction. Yet, we wonder where the film leaves us from here. Surely, the film isn’t over? The functional plot twist, it turns out, is no mere sick joke; it rearranges the texture and the nature of the film at a core, elemental level, playing on our expectations about stardom and cinema and slashing them to bits. It is not only narratively shocking but thematically subversive, rooted purely in audience expectation and Hitchcock’s methodological, obsessive desire to control his protagonists and his audience as well. The film is his toying with us as he had always done with his characters – here he toys with a blond female, his favorite such figure, by literally setting her up as the main character and unceremoniously writing her out of the film. And he toys with the male lead by depicting him as a passive loser and yet essaying our sympathy toward him for his helplessness – we actually start to question ourselves and come to move back and forth between wanting Norman to escape his mother’s grasp and seeing him as complicit in the actions as well. We become implicated in Norman’s own personal tragedy, a tension expounded upon by Perkins’ own slightly-off-center enigmatic unease of a performance. It’s a scary proposition to court sympathy for such a character, but Hithcock was always about scary, unnerving propositions, something he never pulled off better than here. If the film has a flaw, it’s a small one. Late in the film, after the climax, a psychiatrist spends a couple of minutes delivering exposition about Norman and his mother that is downright saddening. Not only are these kinds of things best left unsaid, but the film has already gone to great effort to show us what it here feels the need to say. 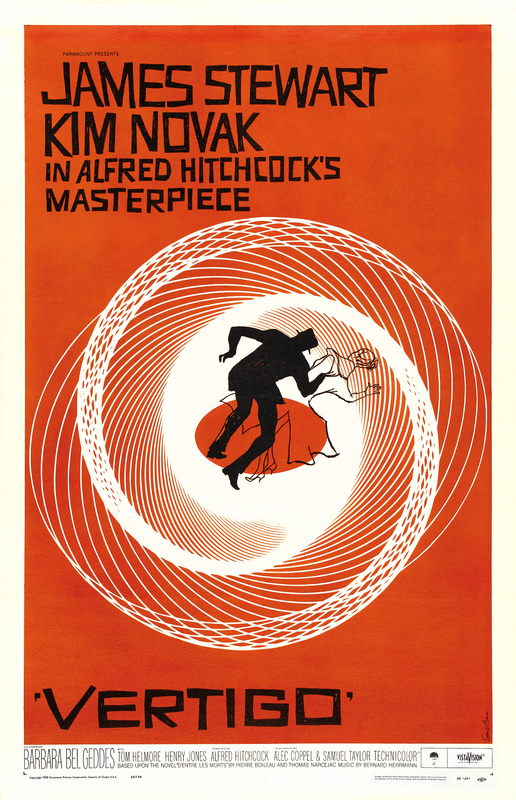 It’s didactic and displays a lack of confidence for the usually assured Hitchcock, but it’s a small flaw that does little to damage the reputation of a true masterwork. Counterbalancing this however is the film’s pure visual craftsmanship. It remains, for all its sub-textual questions and problematic concerns, replete with Hitchcock’s finest camerawork and editing, even beyond the famous shower scene. Later on, there is a famous murder where a victim falls down the stairs while dying, given a hallucinogenic edge that captures better than anything in Vertigo (not a film about the fear of heights anyway) the pure, surreal sensation of falling. And of course there’s the conclusion, whose defining feature is a light-bulb swinging back and forth as it illuminates and darkens the unfolding events like a garish, atomic ball of pure energy. Howard Hawks once said a “good” movie is a film with three great scenes and no bad ones. Well, this film has one bad scene, but matches it to these three aforementioned scenes which aren’t great but monumental, along with plenty of great ones, all of which isn’t to mention the very game-changing narrative bending of the film, something never done before nor repeated with the success seen here. Besides, I’ve always been more of a cohesive “full experience” viewer than the kind who weighs positives and negatives, and this film, as a full experience, is unnerving, subversive, and downright terrifying in its clinical descent into hell. Of course, some of the impact has been diluted over the ensuing fifty years – it’s less emotional than intellectual now, since many of us know how the story proceeds and have seen the multitudes of films which borrow heavily, and indeed owe their existence, to Psycho. Today, the film feels slightly more like a time capsule work to appreciate rather than to experience, but damn if that doesn’t just make it all the easier to admire. Perhaps no other film in the history of cinema marks a before and after like this one- narratively, Hitch completely rewrote the book (for English language cinema at least – one need look no further than Antoniono’s own L’Avventura released the the same year for a foreign language film that spent as much energy on completely destroying the logic of narrative filmmaking, but far fewer filmmakers have seen that film so by definition it is less “important” to the development of film). In a sense, this may be the most important film ever released. But importance and film history, and even thematic nuance, take a backseat to Psycho’s worth today. That’s because Psycho has never been about thematic nuance – it is, at the end of the day, a direct distillation of just about the purest cinema Hitchcock ever produced, something ruthlessly efficient and purely dedicated to its own craftsmanship. It’s his greatest stylistic achievement and his most visually energized and oppressively constructed film, designed with every scene to confuse and confront us and our expectations. He winds us up painfully and refuses to let go. If that wasn’t enough, it is also a rather breathless commentary on filmic expectation and audience voyeurism that never once (well, only once) tells what it can show. The idea that a certain character must inevitably survive the film, that a certain lead actress must be the star, that films should follow a certain structure as they take us along with that star – all are subverted gleefully by the film’s narrative structure. Hitch steadfastly and destructively confounds expectations and throws our role as an audience under the bus by quite literally rubbing our faces in our understanding of role and character in a film. Best of all is that Hitch accomplishes his technical mastery and his thematic wonders in perfect harmony, never once laying his themes on top of the film but always tackling the more difficult question of how to create the theme in the film itself. Theme in Hitch, as it always should, comes from form, even when so many other films make the mistake of doing it the other way around. All of this, and it is a real wonder that Psycho is really nothing more than the famously bald director letting his hair down and playing with us. For what reason you ask? Sure, he plays for the sake of a commentary on filmic viewership and on masculinity and the male gaze. But his real reason is far more pure and giddier: he woke up one morning and thought it would be a fun thing to do before teatime. Remember, this is Hitch, a man for whom diabolical malevolence was synonymous with fun; he scrapes us along his ragged, angular celluloid surface like butter on the crumpet he eats to congratulate himself for a good day’s fright. This entry was posted in Film Favorites, Review and tagged alfred hitchcock, anthony perkins, Film Favorites, horror films, Score: 10/10, screwing with the audience on July 22, 2014 by jakewalters98.